The Volkswagen T-ROC concept has been shown for the first time at a special preview event ahead of the Geneva Motor Show. The T-ROC is smaller then the current Tiguan and previews a new compact SUV that will rival the likes of the Nissan Juke and Renault Captur. 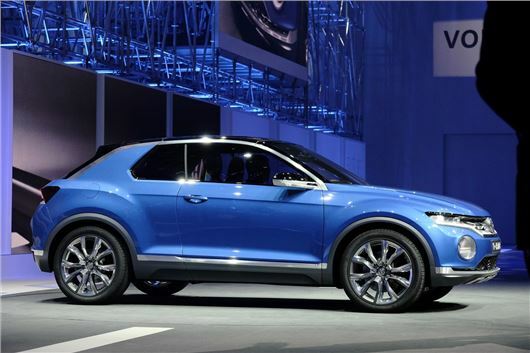 The T-ROC is not the only small SUV due from Volkswagen. The Taigun, which is based on the Volkswagen Up, is currently in development and due to be launched in 2015. The larger T-ROC has two doors and four seats although a production version would no doubt be a more conventional four-door design. The front end design features oversized circular headlights integrated in the front bumper and LED headlights while the middle section of the roof, which is made of carbon composite, can be removed in two halves and stored in the boot. It's certainly a more daring design than we've come to expect from the usually conservative Volkswagen styling. It uses the same platform as the latest Golf with short overhangs while as a nod to its off-roading design the concept is fitted with integrated cameras which display images in the cabin via a 12.3-inch tablet in the centre console. The concept is fitted with 19-inch alloys. The T-ROC is powered by the 2.0 TDI engine used in the Golf GTD with 184PS. It comes with 4Motion four-wheel drive and a seven-speed DSG gearbox. Acceleration from 0-62mph takes 6.9 seconds while fuel economy is predicted to be 57.6mpg with CO2 of 129g/km. There are three different driving modes – Street, Offroad and Snow – which alter the suspension, engine and gearbox plus the hill start and hill descent assist systems. Juke looks far better,this vw a complete disaster.The back end looks like something from the seventies America.nissan miles ahead of the game. I love it! It looks like a real car rather than a toy (juke) and is probably more practical and spacious.